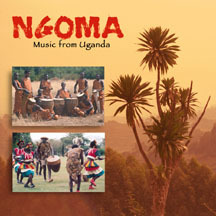 Compiled by the acclaimed Ndere Troupe in 1995, the recordings from the Ngoma Project for Cultural Preservation present a wealth of traditional music from Uganda. This is the most comprehensive collection of traditional Ugandan music to date. Inspired performances by master musicians from the region's most important ethnic groups utilize a wide range of instruments including harps, mbiras, zithers, xylophones, and a wide array of African percussion. Fourteen tracks of music, digitally recorded and mastered.